We all want our Dads to have a Happy Fathers Day, don’t we? To help you all show your appreciation for your Dads this Fathers Day, we have some lovely free printables, courtesy of Tiny Me again, that give you some great ideas about what you need to think about that your Dad does that is special. When our Dads have really made us laugh. Plus a few other great ways to remember and appreciate his care, love and attention. Follow Helen Neale – KiddyCharts’s board Love Fathers Day with kids on Pinterest. We also have a Pinterest board covering Printables too, where you can find some of our free resources, as well as those from other sites across the globe. Follow Helen Neale – KiddyCharts’s board Printables on Pinterest. Sometimes it is hard to tell our Dads just how much we care about them. Fathers Day is definitely a good time to give them something to smile about. A wonderful idea would be to fill out this printable every year with your children and see how their answers are changing as they grow. Without further ado – here are your Dad Appreciation downloads for Fathers Day. We hope you have a special time with your Dads everywhere. We hope you like these, do take a look at our other free Fathers Day resources too. 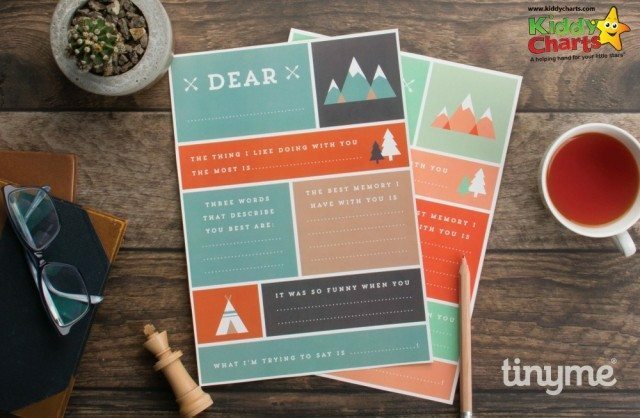 I LOVE these printables – so cool. They are by far the best looking ones I have found – helloooo pinterest!